Eligibility Criteria: Masters Degree from the University within country or abroad, duly recognized by HEC. Duration of Internship: Duration of internship will be for 1 year. Stipend: Stipend will be Rs 20,000 per month. 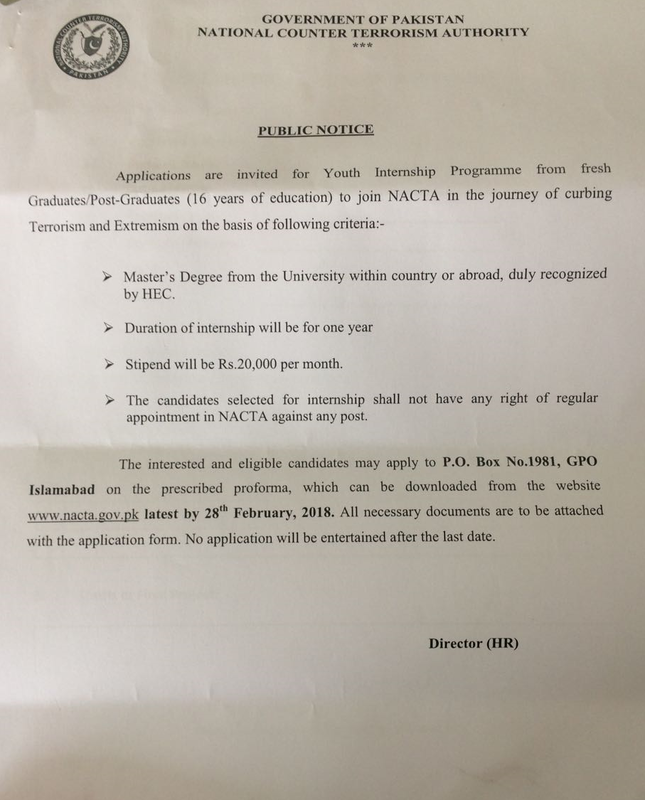 Note: The candidates selected for internship shall not have any right of regular appointment in NACTA against any post. How to Apply: The interested and eligible candidates may apply to P.O Box No. 1981, GPO Islamabad on the prescribed proforma, which can be downloaded from the website: www.nacta.gov.pk by latest 28th Feb 2018. All necessary documents are to be attached with the application form. No application will be entertained after last date.